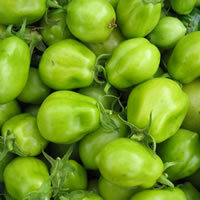 Outdoor or indoor varieties can be used, these are an outdoor italian plum tomato "Roma". If you are left with a glut of green tomatoes following one of our english summers, this chutney is the best way of utilising them. It goes well with cold meats and cheeses, and can be served with or added to curries. Put the chopped tomatoes, shallots or onions and the apples in a large, heavy-based pan with half the vinegar. Bring to the boil, then simmer gently for about 30 minutes until tender. Tie the chillies and root ginger in a muslin bag, bruise with a hammer/rolling pin, and add to the pan with the raisins or chopped dates. Cook, stirring from time to time until the mixture thickens, after about 1 hour. Add the salt, sugar and the rest of the vinegar, stirring well until the sugar dissolves. Continue cooking, pressing the bag of spices occasionally with a wooden spoon, until the mixture is thick. Remove the muslin bag before potting and sealing). Leave to mature for at least six weeks.